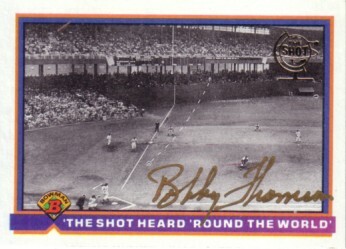 1991 Bowman card commemorating the 40th Anniversary of The Shot Heard Round The World autographed in gold paint by the late New York Giants superstar Bobby Thomson. About NrMt condition. With certificate of authenticity from AutographsForSale.com. ONLY ONE AVAILABLE FOR SALE.